And this is the GOOD guy! 5 Responses to And this is the GOOD guy! He gets a little more humanized later when he loses the mask and gets a girlfriend. …and then he gets married and she makes him throw all his stuff away and becomes disgruntled again. Vicious circle of life! 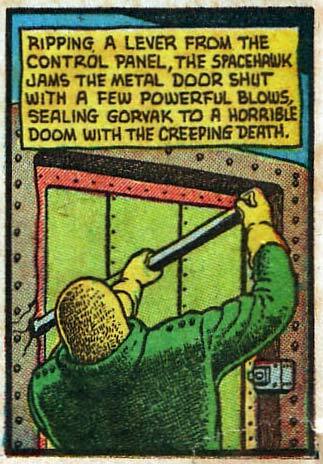 Yeah, but The Creeping Death is actually 9 year old Wally Cankershank and his Fire Ant farm. Gorvak should be fine, and Wally’s dad is on his way with the Space Police and a can of Raid.
. . . And then Spacehawk began to cry, realizing that, as the last player in the room, he could have just pulled that lever repeatedly until he won the Triple Jackpot . . .